Friday was really tough... I've far exceeded the activity level that I can handle. I attended several sessions, but felt bad about the endless squirming and had a very tough time concentrating. I'm still way, way worse than normal. There was a great lunch session that included a debate style discussion between Rolando Garcia and Rudi Bertagnoli. It was very informative and VERY entertaining. 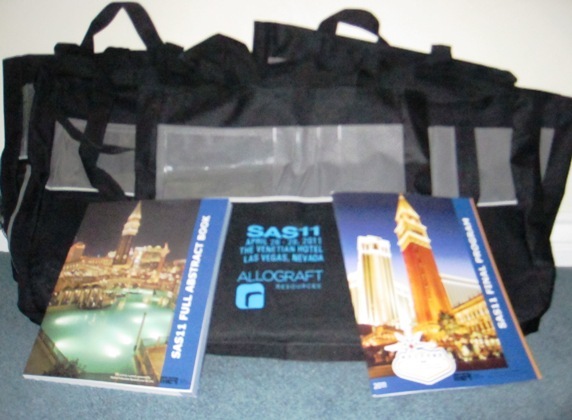 I was able to snag 5 extra conference bags that include the final program and the full abstract book. These were VERY heavy... I had to check an extra bag ($$) to get them back. I'll be adding these to the lending library. The first 5 people who request them will get the bags and get to keep the books if they wish. But... they must be willing to loan them to future recipients, who will be required to send them back when done. Everyone who receives them, should post about the materials and what they got out of them. I was also able to snag the presentation DVD from SAS-6 (2006 Montreal). This is an amazing resource. Most of the presentations are available in a multi-media format with the presenters slides synced with with the actual audio from the conference. I'll post more details later... I still must recover and catch up.